Click to download to PDF version of the community survey. 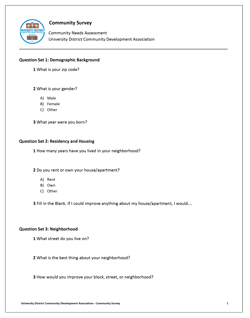 The UDCDA is currently running a Community Survey that asks residents questions about housing, transportation, neighborhood, families, recreation, and community events. The goal is to better align the UDCDA’s programs and resources with the needs in the community. 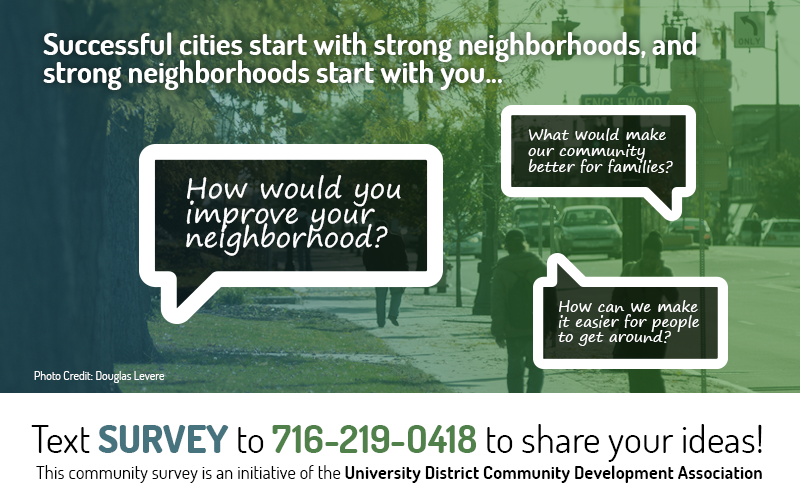 By participating in the survey, you can help build a stronger University District! The UDCDA will be collecting survey responses over the next two months via text message as well as hard copies available at the Gloria J. Parks Community Center (3242 Main Street) and the UDCDA Housing (995 Kensington Avenue). You can also download a PDF of the survey by clicking on the thumbnail to the right. To begin the survey, text SURVEY to 716-219-0148. Note that standard message and data rates may apply. You will begin receiving survey message in groups of three questions every three days for three weeks. Reply STOP at any time to opt out of the survey.